My mind filled with a sense of accomplishment…. The past two weekends the dogs and I have traveled to as far south as Lakeland, Florida and as far west as Folsom, Louisiana. I’m tired, the dogs are wired with pent up energy and my credit card is smoking. It’s time to stay home for a while and go back to living a normal life. 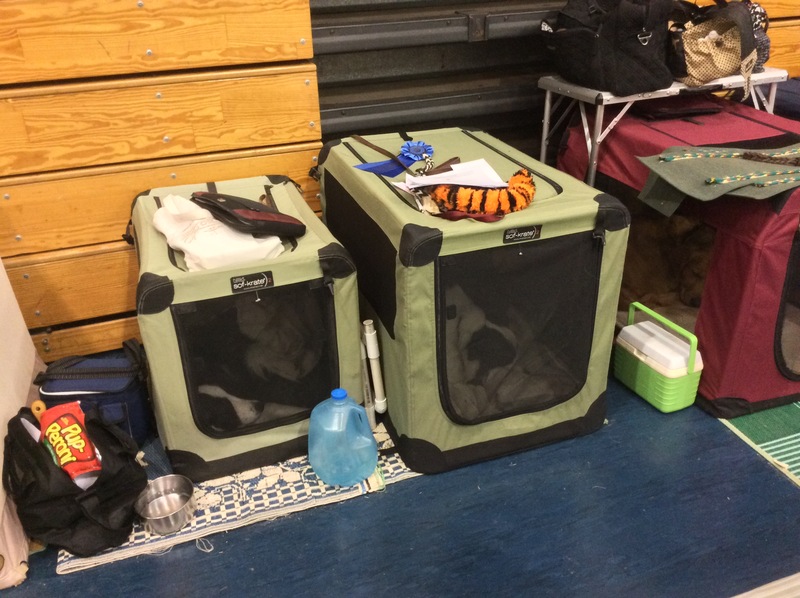 Dogs in “soft crates” ringside. January 10th and 11th Victory Hulett, gave an intense dog obedience seminar at the Imperial Polk Obedience Club facility in Lakeland. The seminar was so enlightening that I decided to submit an article and video about it to a national dog training magazine, Front and Finish. What was I thinking? Writing for a magazine involves deadlines, editing and rewriting, verifying facts, as well as gaining permission to use photographs. But the article has been submitted and will hopefully appear soon in their February or March online issue. My Border Collie girls, Razz and Tommie, rode with me to the seminar. My goal was to socialize them to long distance travel, hotel rooms, new dogs and training locations, knowing though that Razz has a particularly bad problem with a weak travel stomach. I actually made it six and half hours from home before Razz surprised me by upchucking her breakfast. By the time I was able to stop and clean up the mess, she had taken care of it for me. I know; too much information. But that’s dogs for you. They are disgusting by our standards only. I don’t think most animals have a gross-meter. But I sure do. For a change of scenery I drove south on route 19, east of Tallahassee, rather than take the busy Interstate 75, that funnels traffic south toward Orlando. Back in the day, before I-75, highway 19 must have been the main southern route. There were numerous remnants of hotels, gas stations, homes and businesses, now abandoned shells, a reminder of a more affluent time. Highway 19 also included long stretches lined only with pines as well as oak trees draped with long fringes of dry grey/green moss. It would not be a good place to have a vehicle breakdown and I made a note to myself to take Interstate 75 on the way back home. The maps application on my cell phone guided me to the La Quinta hotel in Lakeland where my dogs were able to stretch and potty on narrow strips of grass, areas that were, sadly, filled with litter and animal feces. I’ve found in my travels that the general public often does not pick up after themselves or their dogs at hotel sites. For south Florida it was very cold and windy, making me question my sanity as I stood outside several times with the dogs. Images of home and a secure, clean yard for the dogs, filled my mind. By the end of the seminar weekend though, it was a balmy 78 degrees. Driving home Sunday night along Interstate 10 west of Tallahassee, I even heard the frogs and crickets in full volume in the swampy fields, a sound heard usually only in the summer. The next weekend trip was to be my first attempt traveling with three dogs, more insanity. But at the last minute Razz came in season and she was relegated to the vet’s office for four days. That left Catcher and Tommie riding comfortably in their crates, my Subaru packed with everything I could conceivably need. Again, not only was it very cold but it rained hard the entire trip to the Covington, Louisiana exit. Yet again, I questioned why I consider showing dogs to be fun. But at the first rest stop in Louisiana I ran into my training friends. We laughed and joked. The camaraderie made the bad weather, the early hour and my ring nerves all worth the effort. Catcher’s training fell apart last year, forcing me to take the time to analyze, re-train, and put my goals for him in perspective. During the time off we trained almost every day, we played, and we even acted silly together. 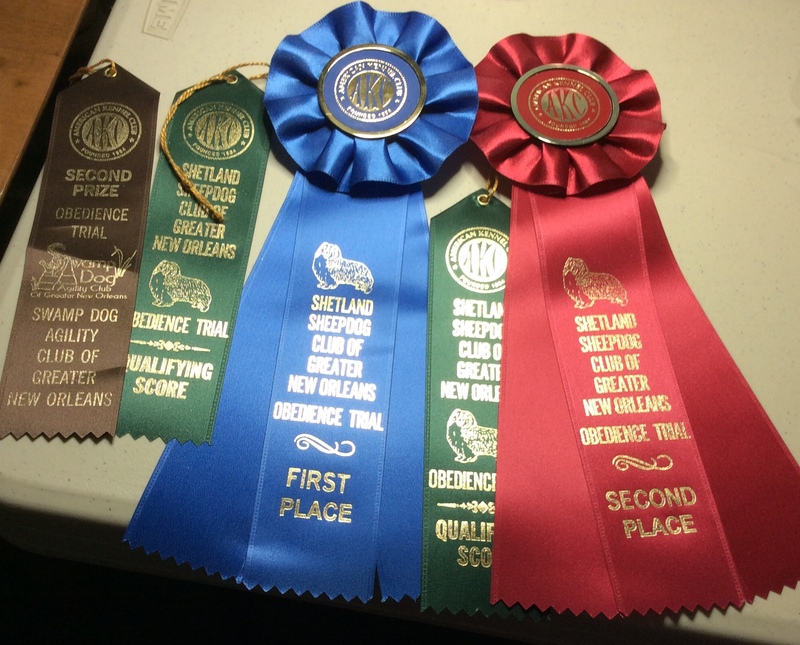 The months away from the show ring were worth it as we went home from the Folsom, Louisiana show site with an obedience title and some ribbons. Catcher’s reward-pillows. He loves pillows. Saturday night, exhausted, the dogs snoozing in their car crates, I drove nonstop back home to Florida, my mind filled with a sense of accomplishment and overflowing with the love I have for my dogs. The three young Border Collies will continue to be trained for the upcoming shows. But upon returning home I was surprised to receive an email that, in a couple of months, offered Catcher and I an opportunity to go off in another direction. The email proves to me that you never know what paths life will take you. My little stubborn and independent dog, who most people would have given up on training a long time ago, continues to surprise me. 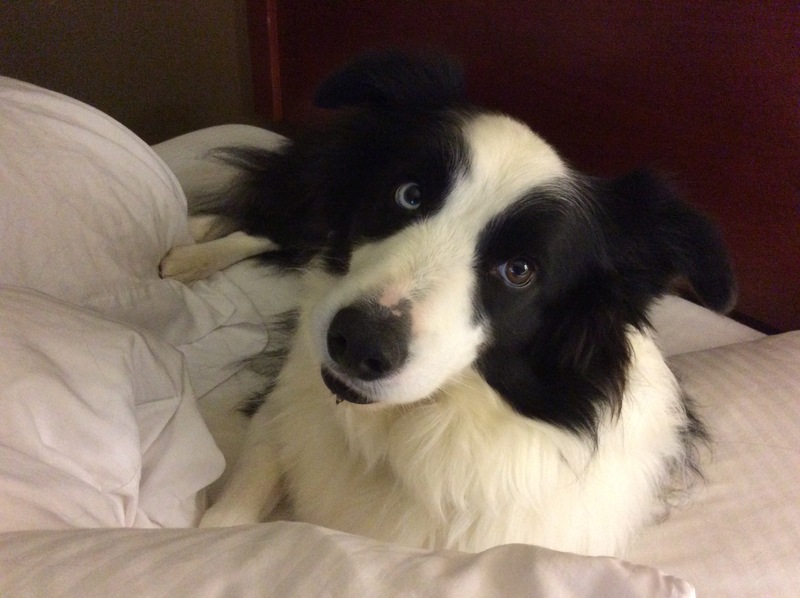 This entry was posted in border collies, dog obedience, dog obedience trials, Dog training, Dogs, Retirement Life, travel and tagged Border Collies, Dog training, Obedience training, Obedience trial, Pets, retired life. Bookmark the permalink.